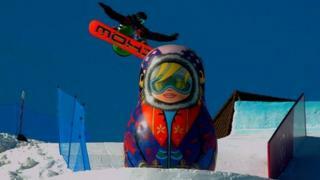 Competitors thrill the crowd with tricks and crashes in qualifying for the inaugural slopestyle snowboarding competition at the 2014 Winter Olympics. Britain's Jamie Nicholls qualified for Sunday's final in the first event to be held in Sochi ahead of Friday's official opening ceremony. Fellow Britons Billy Morgan, Jenny Jones and Aimee Fuller are through to the semi-finals on Saturday.